I was out having lunch with my friend Michelle a couple months back, and we went to Sweet Basil Café in Herndon, a favorite lunch spot for the work crowd. That day they had a mango chicken salad on the specials, and it sounded so appealing that we both ordered it. The flavors really hit the spot with sweet mango, grilled chicken, lemon vinaigrette, and nigella seeds, and I knew I had to give this one a try at home. 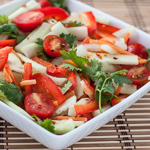 I like dinner salads in the summertime because they are so easy and light on hot days. For my version I used fresh Romaine, our homegrown Thai basil leaves and green onions, fresh sliced mango, and slices of our favorite Thai Grilled Chicken with Coconut Milk Marinade. I made a full batch of the chicken and used it for a main course and saved the leftovers for salad, something I like to do with any grilled chicken. The nigella seeds challenged my grocery store search efforts, and I had to substitute black sesame seeds, which worked out just fine. One serving of chicken should be about 4 ounces, so the breasts don’t need to be huge. If they are very large, allow 2 salads per breast. You can grill the chicken a day ahead and keep it chilled until the next day. 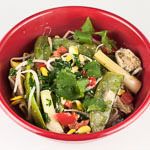 The dressing can serve more than two and will keep in the refrigerator for several weeks. One day before, marinade the chicken according to the recipe directions. Grill the chicken and set aside any leftovers. Whisk together the lemon juice, Thai fish sauce, and brown sugar. Pile lettuce, onions, and basil in two salad bowls. 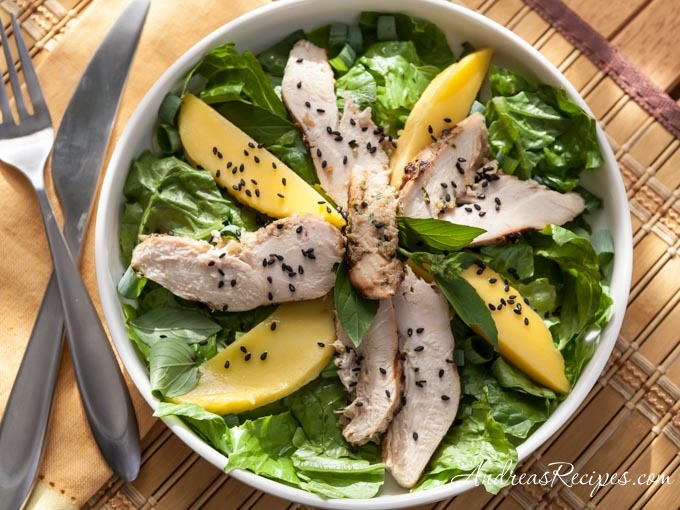 Slice the leftover chicken on the diagonal and place strips on salad, then lay on mango slices. Drizzle on the dressing and sprinkle on the sesame seeds. 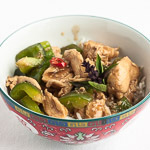 This really sounds good; I love Thai flavors. I’m curious about the salad you had at the restaurant too. I’ve never had nigella seeds and always wondered about them. Thanks Kalyn. Nigella seeds are interesting, a little peppery but with a warmer flavor and a bit bitter.